The tiny pug nose, nestled between round, saucer eyes- Unmistakable! The silly, affectionate, easy-going disposition- Irresistable! But where is the huge, flowing coat that requires so much bathing and grooming? Relax, folks- this is no Persian. It's the Persian in sheep's clothing: the Exotic! 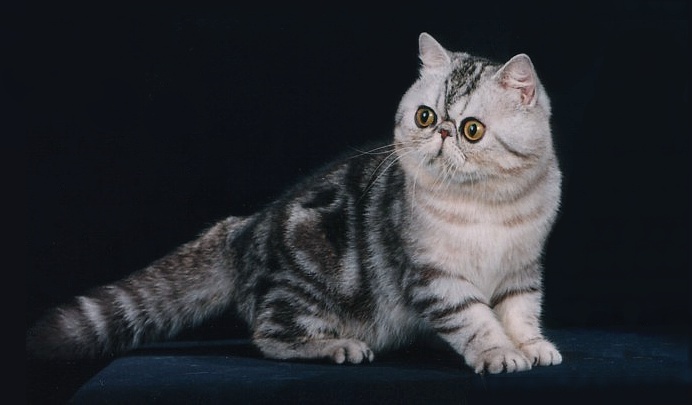 Originally concieved as shorthaired cat with some Persian features, the Exotic first gained breed acceptance in 1967. Thanks to the hard work and dedication of countless breeders, the Exotic has come a long way since then. 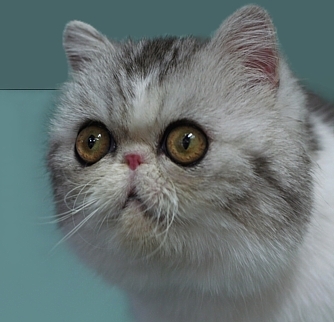 In 1990, the Exotic Breed Standard was revised to parellel the Persian Breed Standard, word for word. In 1991, Jovan The Ledgend became the first Exotic to earn the title of Cat of the Year, the cat fancy's most coveted honor. Only half of Exotics have short hair! 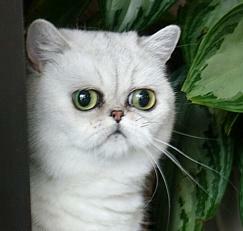 The other half have long hair and are indestinguishable from any other Persian. Thanks to their Persian ancestry, most Exotics carry the recessive longhair gene. As a result, even breedings between two shorthair Exotics results in longhair kittens! 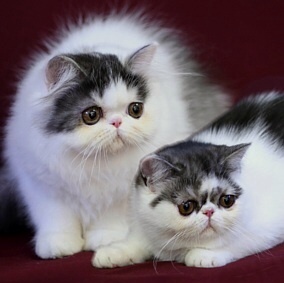 These longhaired Exotics are identical in every way to so-called "pure" Persians. Registries all arround the world recognize longhaired Exotics as Persians. CFA is the only association which does not. However, as of 2009, longhair Exotics are elligible for competing at shows in the Persian class. Currently ranked as 5th in kitten registrations, the Exotic has grown from a minority breed to one of the most popular. We think this popularity is well deserved! Follow the links at right to learn more about this wonderful breed.